Welcome to Vardhman Dies & Mould ToolsManufacturer & Exporter of HSS Piercing Punches & Ejector PinsThe company was established in the year 1999, at Mumbai. Ambla Cement, Bajaj Auto & L& TLtd. are some of our prestigious clients. Prompt delivery, Assured quality & customization facility are the plus points of our organization. We offer a huge gamut of Piercing Punches, Guide Pin Bush, Ejector & Dowel Pins. Piercing Punches offered by us are well known for their durability. We offer Ejector & Dowel Pins that are widely acclaimed in the market. We also provide Guide Pin Bushes that are available at affordable prices. 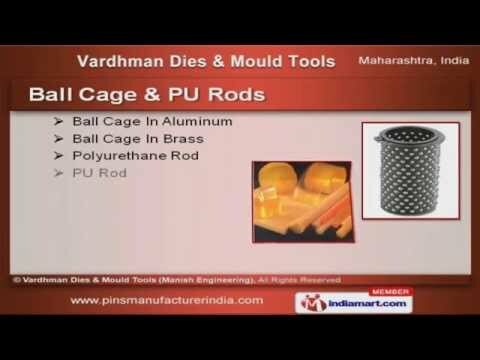 Our Ball Cage & PU Rods are extremely reliable. Along with that we offer Mould Base Sets that are cost effective.